Carpenter ants are one of natures most aggressive wood destroyers. Similar to termites, carpenter ants damage wood. Unlike termites however, carpenter ants do not eat wood for food. Carpenter ants only bore into wood to establish and/or enlarge their nest. Carpenter ants can be considered wood destroying pests because of their ability to cause damage to wood. If carpenter ant nests are left untreated and undisturbed, the shear numbers of ants can be enormous and the resulting damage caused by “mining” of wood to increase the nest can be substantial. 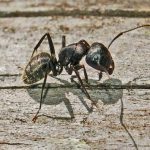 Typically, carpenter ants typically seek wood that has been softened by moisture, decay or other insects. They may discover your home is a suitable location when they are seeking drier conditions. They wander in through narrow gaps and holes they discover around the outside of the home, and look for a protected cavity in which to set up a new home. They often discover voids already in existence, such as hollow doors, wall voids, spaces between insulation and flooring in the crawl space. They may go to the trouble to make their own cavities, excavating the wood using their strong jaws to bite off tiny pieces of wood until a chamber is formed. ©2010 - Clean-Kill Pest Control Inc. All Rights Reserved.